"Nishanpur is not a city built of stone, instead it is built of intrigues and betrayals, layer upon layer, all set in a foundation of blood." 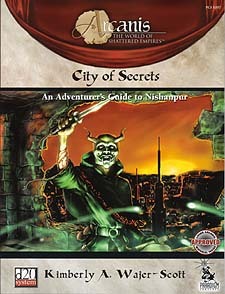 Nothing is simple in theCity of Secrets. With the Swords of Nier in control of the city, a great unrest has settled over the population. The authoritarian regime of the Swords is beginning to destroy the commerce that has always been the lifeblood of the city. While the citizenry suffers, the Nerothians, dark servants of the Lord of Death, scheme to overthrow the Autocrat of Erduk and return Nishanpur to Canceri rules. To this end they have found unlikely allies with the Seekers of the Hidden Master, devil-dealing Sarishans intent upon returning the dreaded and ancient Devil-Kings to their place of power. If left unchecked, this benighted coalition will bring forth a new abomination unto the world, and replace the foreign tyrant with an even greater evil. Requires the use of the Dungeons & Dragons Player's Handbook, Revised Edition.